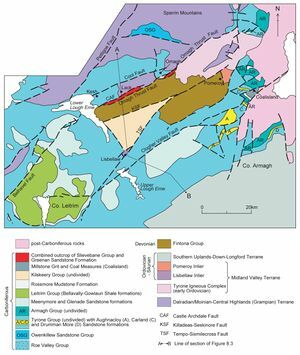 Carboniferous basin development is attributed to extensional reactivation of Caledonian basement faults in a north-south tensional field . The driving force creating the tension probably resulted from the Bretonic subduction event far to the south of Ireland and Britain. In different parts of Ireland and Britain the sequence of tectonic events was never consistent throughout Carboniferous time. In northern Britain the sequence of events commenced with an early Carboniferous rifting event which was followed by thermal sag in the late Carboniferous, the transition being represented by sedimentation in the early to mid-Namurian period. Detailed analysis of the Carboniferous history of the Midland Valley of Scotland recognised both of the main events. However, the important and persistent influence of dextral strike-slip during alternating episodes of transtension and transpression superimposed on this structural pattern, particularly during the Namurian  was also recognised. In Ireland (P947830), intense deformation associated with the Variscan Orogenic Cycle is primarily confined to Zone 1, the area of Devonian and early Carboniferous rocks between Dingle and Dungarvan . In Zone 1, which lay close to the northern edge of the Variscan tectonic front, the rocks were folded and cleaved and finally subjected to thrusting. 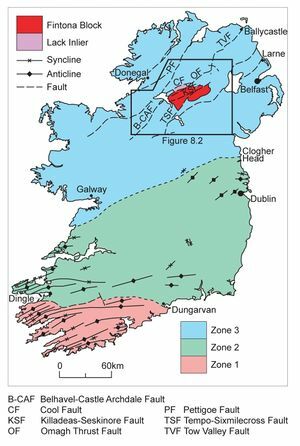 Elsewhere in Ireland, the intensity of deformation declines northwards in Zone 2 and by Zone 3, including Northern Ireland (P947830), structures are gentle folds and major faults (P947831). The principal set of faults in Northern Ireland are orientated northeast-southwest and are probably reactivated basement structures . A suite of shorter northwest-southeast lineaments may also represent basement features, whose reactivation was controlled by motion on the bounding northeast-southwest structures. The final set of lineaments has an ESE-WNW orientation. The principal faults show both dip slip and strike-slip movement and the Carboniferous basins formed in a dextral transtensional shear system in a regional north-south tensional field. In some parts of Northern Ireland it is evident that intra-Carboniferous faulting was responsible for the development of non-sequences and unconformities , , . The dating (K-Ar modal ages) of samples of fault gauge affecting the Dalradian rocks of the southern Sperrin Mountains at 327±13Ma indicates early Carboniferous movement . 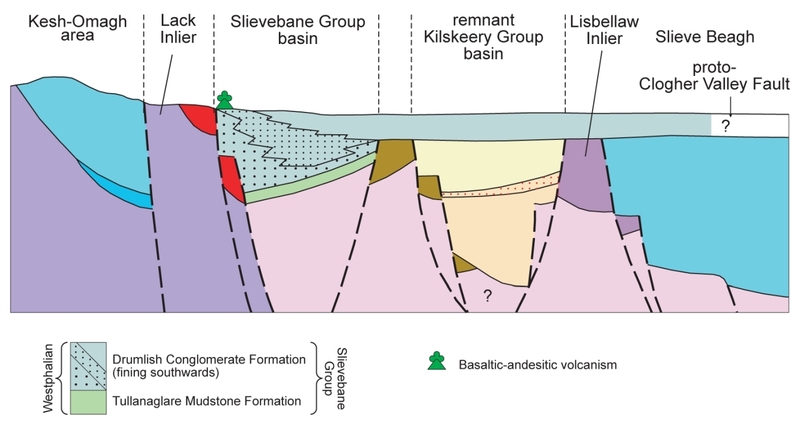 Therefore the main episode of basin inversion, which was responsible for the expulsion of basinal brines, may correlate with late Holkerian-early Asbian dextral transpression and uplift of basement rocks between the Lack and Lisbellaw inliers. Movement of the basinal brine was associated with the precipitation of late gold-bearing quartz in the fault gauge . These effects herald the major, and final, phase of deformation in the end Carboniferous to Early Permian period. It is evident that subsidence of early and late Carboniferous basins in the Fintona Block was a response to recurring episodes of intra-Carboniferous tectonic activity of varying intensity , . The dismembering and juxtaposition of those non-marine basins was largely the result of end-Carboniferous instability. Depending on the severity of each tectonic event the impact on sedimentary processes varied from minimal, in marine facies of the Tyrone and Leitrim groups, to profound resulting in marine regression, regional uplift and deposition of continental alluvium in non-marine basins. In Northern Ireland there is little resemblance between the present Carboniferous outcrop and the configuration of the original sedimentary basins. 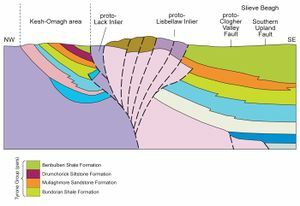 The focus of deformation during the Variscan Orogenic Cycle in Northern Ireland was located on, and between, two major faults. 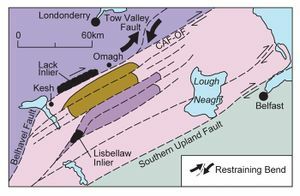 In the north is the northern-bounding fault of the Midland Valley Terrane (P947785), the Castle Archdale Fault-Omagh Thrust Fault zone, while in the south is the Clogher Valley Fault. Carboniferous rocks located between these faults were affected by strike-slip, associated with intermittent dextral transpression and transtension. Between the Clogher Valley Fault and the Southern Upland Fault, the southern bounding fault of the Midland Valley Terrane, the Carboniferous rocks are relatively undeformed (P947832). 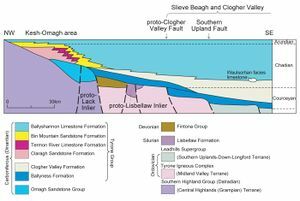 In Northern Ireland, significant disruption to the Carboniferous lithostratigraphy is related to seven separate episodes of tectonic activity that define important stages in the evolution of the area and illustrate the variability of Variscan deformation. The propagation of back-stepping faults aided the northward migration of the first marine transgression (P947833). 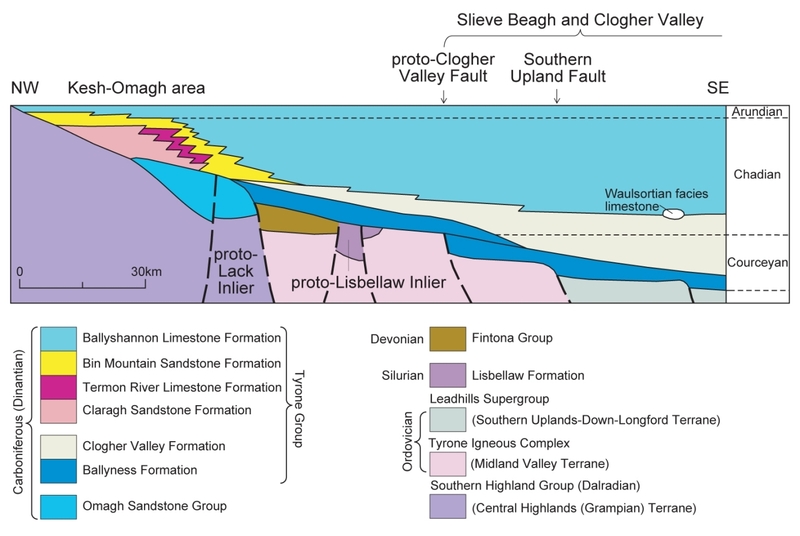 Southeast of Upper Lough Erne and in Co. Armagh, basal Carboniferous red-beds of the Tyrone Group rest unconformably on Ordovician rocks of the Southern Uplands-Down-Longford Terrane and are succeeded by late Courceyan marginal marine sediments. In the Kesh-Omagh area, 50 km to the northwest, the basal clastic rocks of the Tyrone Group are late Chadian (P947831). In the latter area, late Chadian and early Arundian peritidal and shallow marine sediments are overlapped northwards by late Arundian-Holkerian sediments of the outer shelf slope environment (P947936). Reactivated early Palaeozoic faults acted as strike-slip faults in a zone of dextral transpression induced by WNW compression. Structural control was exercised by converging basement blocks at a restraining bend in a wide zone of dextral strike-slip (P947834). Crustal shortening occurred between the Belhavel Fault-Castle Archdale Fault-Omagh Thrust Fault Zone in the north and the Clogher Valley Fault to the south. Uplift of basement rocks between these faults was accommodated in a positive flower structure  in which major faults developed at a relatively gentle angle and with an important thrust component (P947835). Those basement rocks included the Dalradian (Lack Inlier) of the Central Highlands (Grampian) Terrane, in the Midland Valley Terrane the Tyrone Igneous Complex and cover sequence rocks that are now restricted to the Lisbellaw Inlier, and Devonian red-beds. At least 1800 m of pre-late Holkerian Carboniferous strata were eroded and marine and continental basins developed in close proximity. The detritus produced by erosion of the older Carboniferous strata was deposited to the east and southeast (P947831) as the Carland Sandstone, Aughnacloy Sandstone and Drumman More Sandstone formations. Although the original dimensions of the basement block between the Castle Archdale Fault-Omagh Thrust Fault Zone and the Clogher Valley Fault are not known it certainly exceeded the present 25 km between the Lack and Lisbellaw inliers. The ensuing marine regression in the late Holkerian and early Asbian resulted in a permanent cessation to sedimentation in the Kesh-Omagh area. A change in the style of deformation from strike-slip to extension caused rifting and collapse of the domed axial region of the basement block (P947835) and resulted in the subsidence of the basin in which the continental Kilskeery Group was deposited (P947836). Southwest and south of this land area the Meenymore Formation (Leitrim Group) was deposited on a coastal plain of supratidal and intertidal flats fringing the Kilskeery Group basin. In the marine realm, this period of late Asbian extension is marked by the disconformity between the Tyrone Group (Dartry Limestone Formation) and the succeeding Leitrim Group (Meenymore Formation). In Counties Armagh and Tyrone a carbonate platform (Armagh Group) developed seaward of this coastal plain. Reactivated faults at the southern margin of the Central Highlands (Grampian) Terrane defined a new half-graben which received coarse sediment of the late Asbian Glenade Sandstone Formation. This sandstone thins from 300 m at Lower Lough Erne to 4 m in Co. Leitrim, 45km to the south . 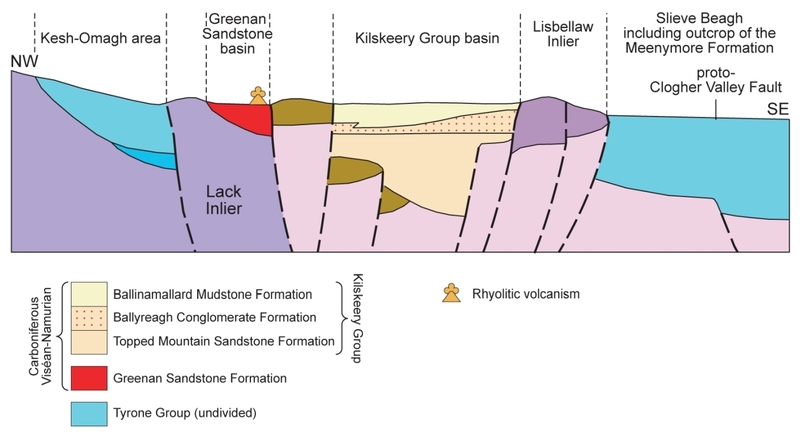 Cyclical sediments of the Bellavally Formation were deposited on the top surface of the Glenade Sandstone in shallow marine, evaporitic and deltaic environments. Until mid-Arnsbergian time, deposition of the remainder of the Leitrim Group (Carraun Shale to Gowlaun Shale formations and the Rossmore Mudstone Formation in Co. Tyrone) was influenced by thermal subsidence. This is exemplified by the persistence of thin limestone and mudstone members beyond the present outcrop of 1400 km2 . In the Carraun Shale and Dergvone Shale formations, sandstone dykes injected into incipient fractures provide evidence of contemporaneous seismicity . 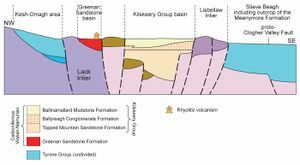 On-going tectonic activity prolonged the subsidence history of the Kilskeery Group sedimentary basin in the Fintona Block and initiated subsidence of a separate basin in which the Greenan Sandstone Formation was deposited. The mid-Carboniferous break in Nova Scotia was the result of dextral transpression and converging basement terranes along a single fault complex . It is also evident in Carboniferous sequences offshore west of Ireland , in the Midland Valley of Scotland , parts of northwest England and in Northern Ireland  where it represents a period of regional uplift and non-deposition extending from the mid-Arnsbergian (E2b1 Ammonoid Biozone) to the late Marsdenian. After the mid-Carboniferous break, sediments of the coal-bearing and alluvial plain red-bed facies associations accumulated at Coalisland and in the Fintona Block respectively. 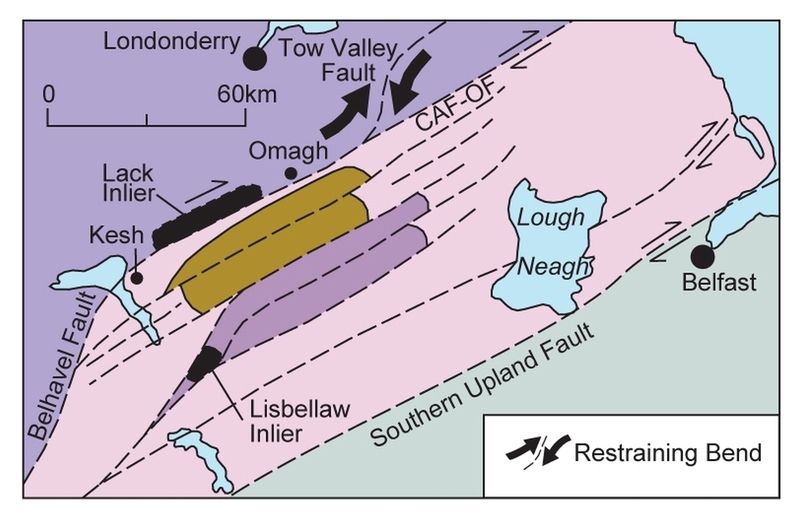 Renewed strike-slip on the Omagh Thrust Fault induced uplift and erosion of the Central Highlands (Grampian) Terrane. South of the fault a new pull-apart basin (P947837) received at least 1200 m of alluvial fan volcaniclastic boulder conglomerate and coarse-grained sandstone of the Drumlish Conglomerate Formation. An identical sequence of events in northeast Canada was produced by a combination of dextral transtension and transpression . Carboniferous rocks of this age are unknown in Northern Ireland. The dating of unfossiliferous clastic rocks that rest unconformably on the Carboniferous in Co. Tyrone as ‘early Permian’ is based only on their occurrence below the Late Permian ‘Magnesian Limestone’. 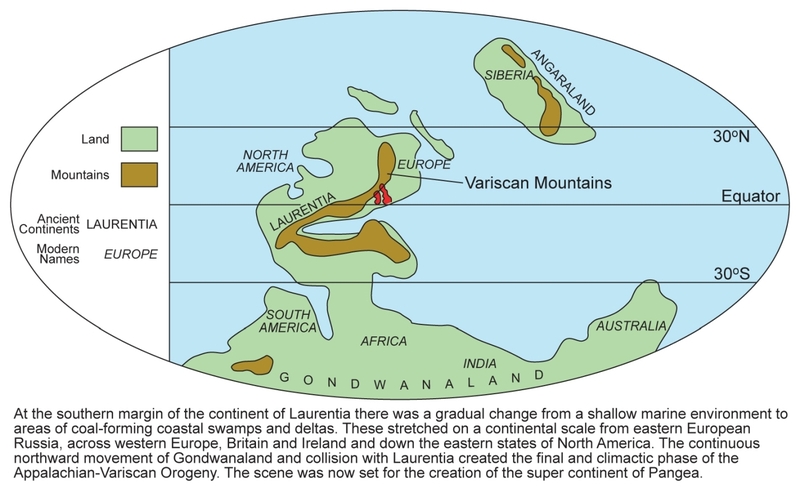 Nevertheless the end-Variscan deformation occurred in the 15Ma period between the late Carboniferous (post-Duckmantian) and Early Permian and gave rise to the Variscan Mountain chain (P947838). The strongest Variscan deformation affected the Greenan Sandstone Formation and Slievebane Group (P947831), adjacent to the Castle Archdale Fault-Omagh Thrust Fault Zone . 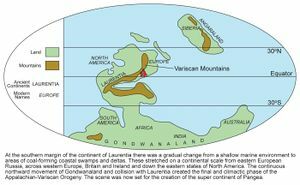 The destruction of the original sedimentary basins of both units, in particular the Westphalian basin, occurred late in the Variscan Orogenic Cycle with the result that the strata remaining in their respective outcrops are only about 550 m and 1200 m thick. 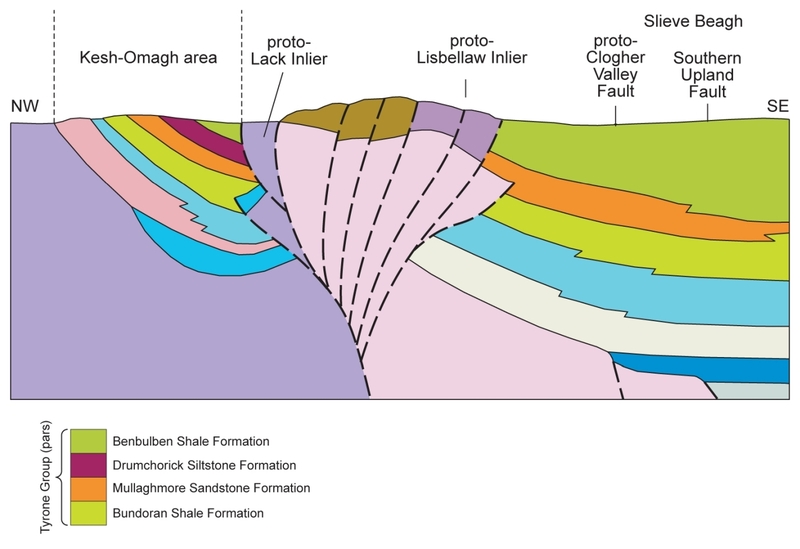 During the end-Variscan period of dextral transpression the remaining strata of both the Greenan Sandstone Formation and the Slievebane Group were located in the footwall of the Omagh Thrust Fault. Clockwise rotation of bedding to the vertical was the result of footwall drag induced by oblique, dextral overthrusting to the southeast on the Omagh Thrust Fault (P947832). It is estimated that Dalradian rocks located at the southern margin of the Central Highlands (Grampian) Terrane were thus transported at least 10 km to the southeast over the Midland Valley Terrane (Tyrone Igneous Complex). Southeasterly-directed thrusting also affects strata in the footwall of the Clogher Valley Fault (P947831). By the Early Permian, a change in the regional stress system in Northern Ireland produced northwest-southeast trending rift basins. Permian rocks below the ‘Magnesian Limestone’ are always thin at outcrop indicating deposition marginal to the main depocentres. In contrast, the Larne No. 2 borehole encountered over 1000 m of Early Permian sedimentary and contemporaneous volcanic rock . ↑ Leeder, M R. 1982. Upper Palaeozoic basins of the British Isles - Caledonian inheritance versus Hercynian plate margin processes. Journal of the Geological Society (London), 139, 481–94. ↑ Read, W A. 1988. Controls on Silesian sedimentation in the Midland Valley of Scotland. In: Besley, B M, and Kelling, G (eds.). Sedimentation in a synorogenic basin complex: the Upper Carboniferous of Northwest Europe. Blackie, Glasgow and London, 222–41. ↑ Gill, W D. 1962. The Variscan foldbelt in Ireland. In: Coe, K (ed.). Some aspects of the Variscan Foldbelt, 49–64. ↑ Millar, G. 1990. Fracturing style in the Northwest Carboniferous Basin, Ireland. Unpublished PhD thesis, Queens University, Belfast. ↑ Wilson, H E, 1972. 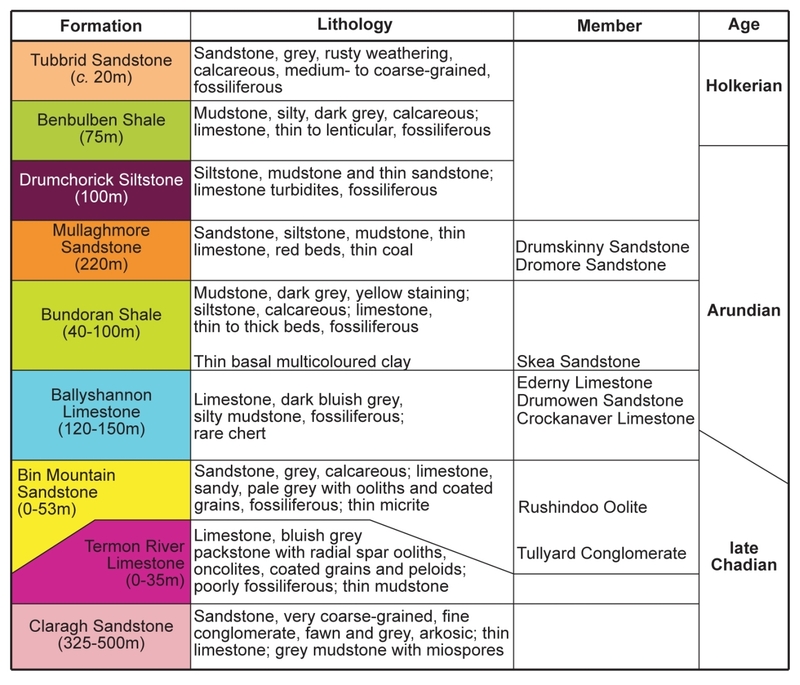 Regional Geology of Northern Ireland. 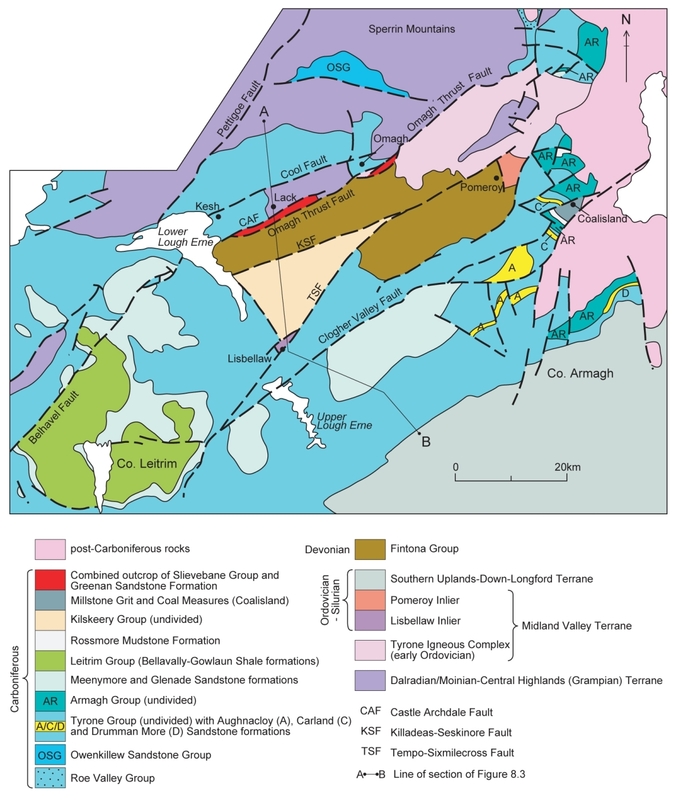 Geological Survey of Northern Ireland. Belfast: Her Majesty’s Stationery Office. ↑ Sevastopulo, G D. 1981. Hercynian structures. In: Holland, C H (ed.). A Geology of Ireland. Edinburgh: Scottish Academic Press, 189–99. ↑ Philcox, M E. 1989. The mid-Dinantian unconformity at Navan, Ireland. In: Arthurton, R S, Gutteridge, P, and Nolan, S C. (eds.). The role of tectonics in Devonian and Carboniferous sedimentation in the British Isles. The Yorkshire Geological Society, 67–81. ↑ Earls, G, Hutton, D W, Wilkinson, J, Moles, N, Fallick, A, and Boyce, A. 1996. The Gold Metallogeny of Northwest Northern Ireland. Geological Survey of Northern Ireland Technical Report GSNI/96/6. ↑ Mitchell, W I, and Owens, B. 1990. 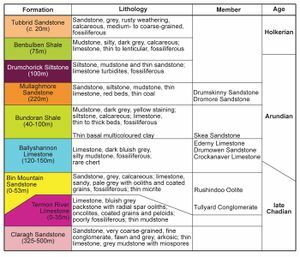 The geology of the western part of the Fintona Block, Northern Ireland-evolution of Carboniferous basins. Geological Magazine, 127, 407–26. ↑ 11.0 11.1 Mitchell, W I. 1992. 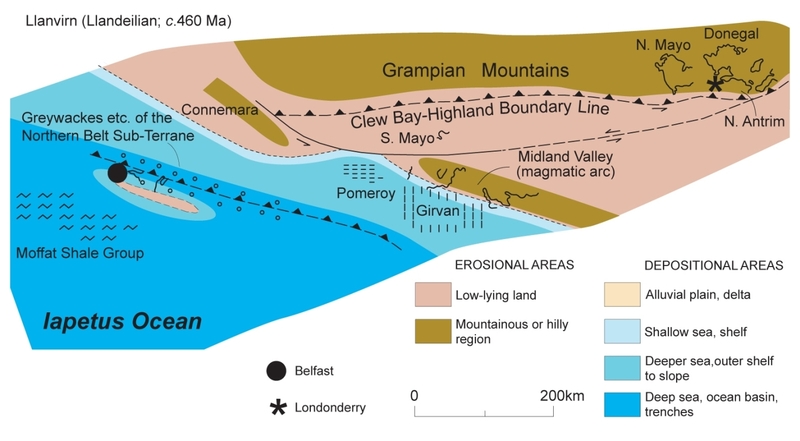 The origin of Upper Palaeozoic sedimentary basins in Northern Ireland and relationships with the Canadian Maritime Provinces. In: Parnell, J (ed.). Basins on the Atlantic Seaboard: Petroleum Geology, Sedimentology and Basin Evolution. Special Publication of the Geological Society, London, 62, 191–202. ↑ Woodcock, N H, and Fischer, M. 1986. Strike-slip duplexes. Journal of Structural Geology, 8, 725–35. ↑ 13.0 13.1 Brandon, A, and Hodson, F. 1984. The Stratigraphy and Palaeontology of the late Viséan and early Namurian rocks of north-east Connaught. Geological Survey of Ireland Special Paper, 6. ↑ 14.0 14.1 Legg, I C, Johnston, T P, Mitchell, W I, and Smith, R A. 1998. Geology of the country around Derrygonnelly and Marble Arch. Memoir of the Geological Survey of Northern Ireland, Sheet 44, 56 and 43 (Northern Ireland). ↑ Calder, J H. 1998. The Carboniferous evolution of Nova Scotia. In: Blundell, D J, and Scott, A C (eds.). Lyell: the Past is the Key to the Present. Special Publication of the Geological Society, London, 143, 261–302. ↑ Tate, M P, and Dobson, M R. 1989. Pre-Mesozoic geology of the western and northwestern Irish continental shelf. Journal of the Geological Society, London, 146, 229–41. ↑ Read, W A. 1989. The interplay of sedimentation, volcanicity and tectonics in the Passage Group (Arnsbergian, E2 to Westphalian A) in the Midland Valley of Scotland. In: Arthurton, R S, Gutteridge, P, and Nolan, S C (eds.). The role of tectonics in Devonian and Carboniferous sedimentation in the British Isles. The Yorkshire Geological Society, 143–52. ↑ Calder, J H. 1998. The Carboniferous evolution of Nova Scotia. In: Blundell, D J, and Scott, A C. (eds.). Lyell: the Past is the Key to the Present. Special Publication of the Geological Society, London, 143, 261–302. ↑ Geological Survey of Northern Ireland 1995. Omagh, Northern Ireland Sheet 33. Solid Geology. 1:50 000. (Keyworth, Nottingham: British Geological Survey). ↑ Penn, I E, Holliday, D W, Kirby, G A, Kubala, M, Sobey, R A, Mitchell, W I, Harrison, R K, and Beckinsale, R D. 1983. The Larne No. 2 Borehole: discovery of a new Permian volcanic centre. Scottish Journal of Geology, 19, 333–46. This page was last modified on 25 September 2017, at 14:13.